While folks in most parts of the country see their irises grow all summer long, mine will slow down unless I keep them watered, which I rarely do. 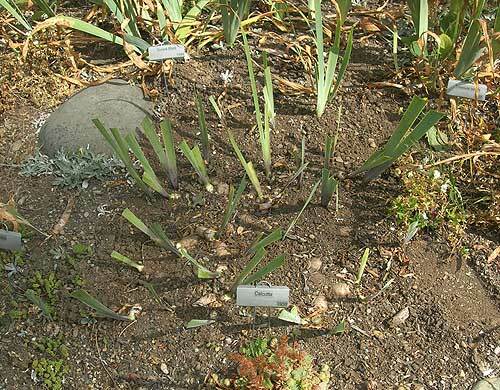 Hopefully your iris beds aren't in nearly such a state. But if you are new to growing irises, have been too busy to get to the garden, and don't know what to do now, this is what late summer clean up looks like in my Pacific Northwest garden. 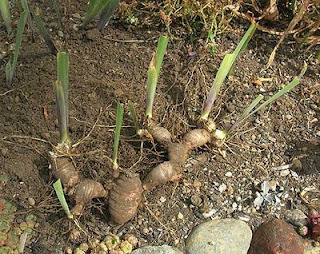 With a few snips of the clippers I have a small bunch of rhizomes to share with friends. Be sure to note the name on the fan. The old mother rhizomes without fans get tossed. The next step is to amend the soil with some fresh compost and a little lime (we have very acidic soil), plant the new variety, and give the whole area a nice deep drink to settle it in and get new growth going. They'll have at least 8 weeks to root in before the first frosts arrive. This is important, as heaving from frost may damage the rhizomes and can leave it susceptible to rot in the spring. A little more clean-up in spring to remove fall's leaves and we're ready again for blooms. 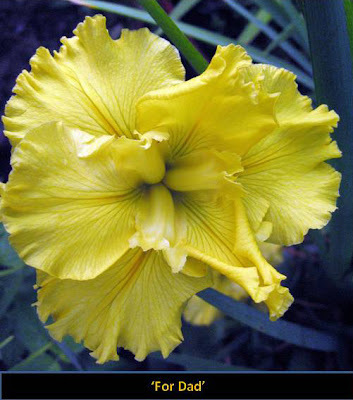 Often, yellow Louisiana irises get too little respect. There was a day when they were rare and prized.Yellow is a recessive color in two of the five Louisiana species: I. fulva and I. nelsonii. At the height of the collecting days before 1940, it was a treat to discover a yellow fulva. It still is today. Yellow nelsonii was even more rare, primarily because that species is limited to a few square miles southeast of Abbeville, Louisiana. 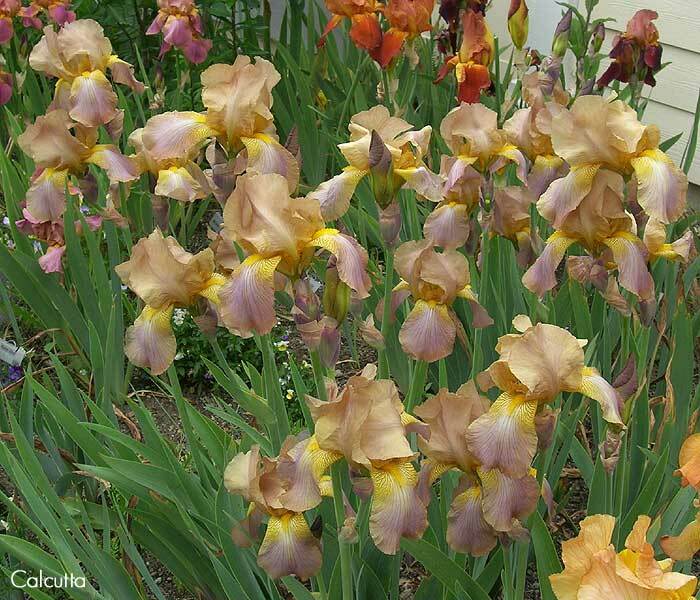 At least for those collected irises that were subsequently registered, there were no more than a handful of yellows, but the yellow genes were there, lurking in the background of the red species and ready to burst forth in hybridizing. T he true yellow form of I. nelsonii appeared lost until recently rediscovered by Benny Trahan. It is the typical mustard yellow, perhaps with a hint of orange, in contrast to the lighter, cleaner yellow of most fulva examples. (Go here for links to the story of Benny's yellow nelsonii). 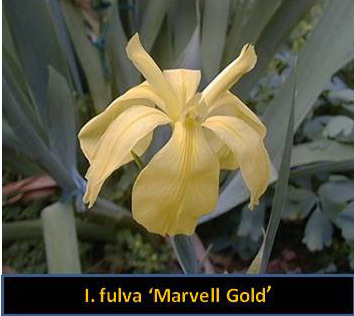 In fact there is a range of yellow shades in fulvas in the wild, from the clean light yellow of ‘Marvell Gold’, discovered in Arkansas, to the butterscotch of Steve Shepard’s ‘Lottie Butterscotch’, found a few years back near Lottie, Louisiana, due west of Baton Rouge. The real reason for any lack of respect for yellow Louisianas has to be laid at the doorstep of I. pseudacorous, at least along the Gulf Coast. Here, where bearded irises are problematic and seldom seen, pseudacorous will flourish, even in areas where it has no business flourishing. 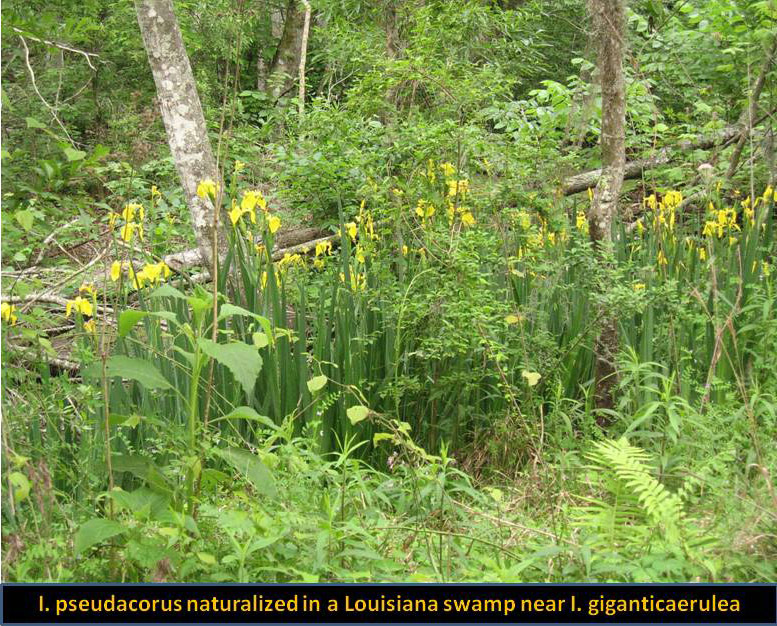 It is an exotic species that, like Louisianas, enjoys a bayou or freshwater marsh habitat. It will escape, establish itself and crowd out other plants, including Louisiana irises. In a few areas, it is a genuine problem. The gardening public sees pseudacorus all around. The yellow form of the species is nothing if not vigorous, so there is plenty available. Landscapers use it, even sometimes when they believe they are planting Louisiana irises. Many people picture pseudacorous even when talking about Louisianas. The number one question iris society members are asked at gardening events, is, “Why aren’t my yellow Louisiana irises blooming?” This triggers a standard narrative: “Do your irises have a midrib? If so, they are not Louisiana iris... Don’t try to mix them with Louisianas... 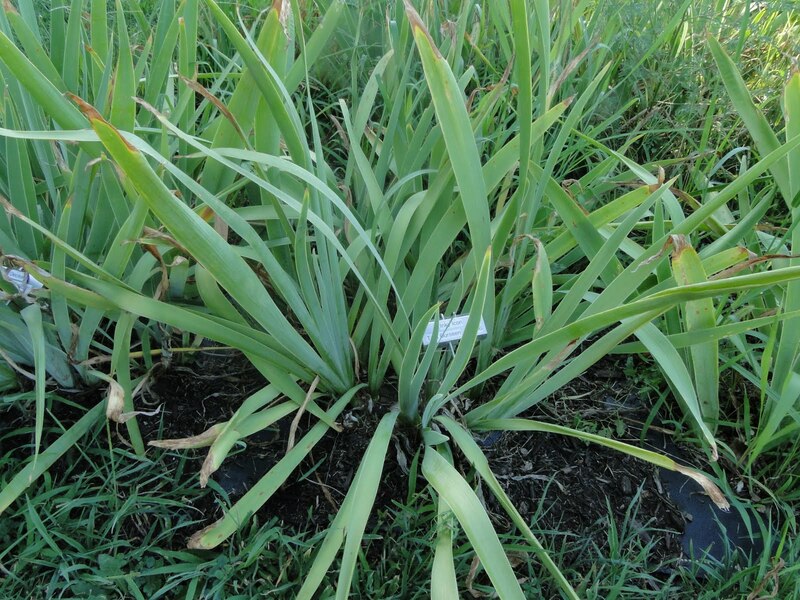 They are great for foliage, but in garden beds as opposed to water do not bloom as reliably as Louisiana irises… You might want to get rid of those (and good luck)... 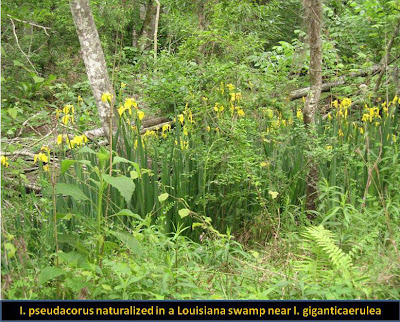 Try some Louisianas... Louisiana irises do come in yellow but also every other color and many forms and, by the way, are actually native." If there is a pseudacorous anti-defamation league, I don’t mean to get it riled up. I respect all the iris cousins and their extended families. Some of the pseudacorous hybrids looks especially interesting and I would like to try them. But as I write from New Orleans, the Louisiana irises are closer kin. Brothers and sisters, tight family. Our native irises get priority over guests, especially ones that sometimes misbehave. But first and foremost, gardeners should know what they have, or might be getting, and make informed choices. There are plenty of modern Louisiana hybrids that can satisfy any craving for yellow. Just a few of the good ones include Harry Wolford’s ‘Edna Claunch’ and new ‘Love Of My Life’; Patrick O’Connor’s ‘Rigolets’; and Heather Pryor’s ‘For Dad’. The yellow line is not hard and fast, and such blends as Dorman Haymon’s ‘Praline Festival’ and Wolford’s bicolor ‘Roar Of The Tiger’ show yellow joining with other colors in spectacular combinations. 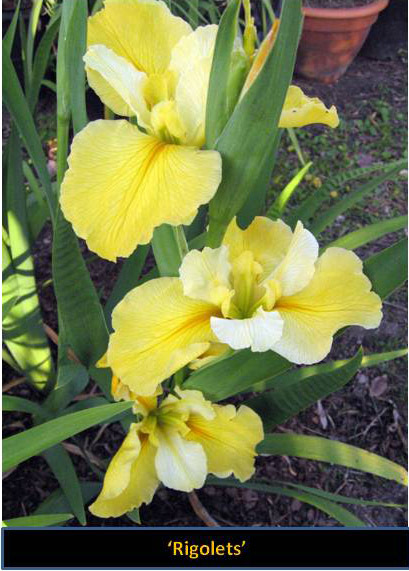 Like all Louisiana irises, the yellow ones continue to improve, with more and larger flowers, improved substance, good form and various embellishments. They will bloom well in a normal garden bed and are good neighbors to other plants. Model citizens, with a tradition of southern hospitality and creole flair. I love history, and I love collecting historic irises and preserving them for future generations just as much I enjoy reading about our iris history. If the heat has you stuck indoors, or maybe you want something to set aside for a cold winter's night, here are some classic iris books that are just the thing to get you dreaming of spring. I'll start with Walter Stager's Tall Bearded Iris, A Flower of Song, from 1922. This book is packed with a thorough examination of the iris in story and song, with numerous quotes and citations. What a wonderful collection for those who enjoy literature, art, music and iris history - all rolled into one. This book is a singular work whose like has not been matched in all the decades since. There is always something to explore again in its pages. Next is Rainbow Fragments, by J. Marion Shull, from 1931. 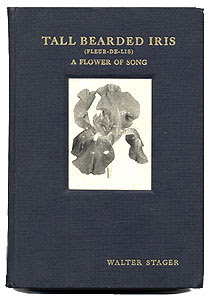 This is one of the earliest books to contain color plates of iris flowers, along with many black and white photos. Mr. Shull was a noted irisarian and was very much into writing about the best irises of his day. 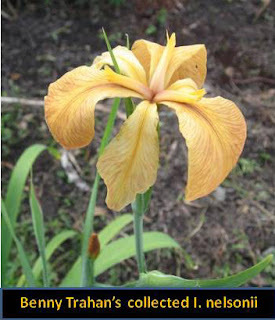 This book contains many descriptions of selected varieties, along with some iris history, cultural and hybridizing information. It was one of the best books of its age and is a fun read too. 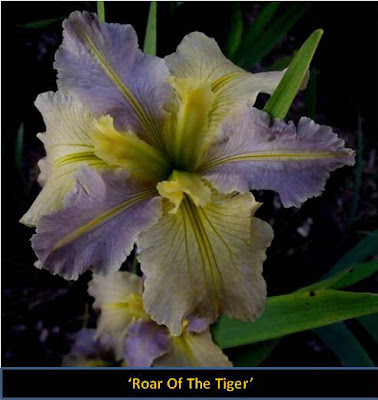 Altho Mr. Shull has a very flowery and poetic way with words that is amusing from a modern perspective, it is full of great information and stories about the early 20th century hybridizers and irises. In 1954 William J. McKee and Prof. J.R. Harrison published their book Half Century of Iris. This book, being a comprehensive history of iris development during the first half of the 20th century, is invaluable to the historic iris collector. Numerous histories of patterns and color development are accompanied by varietal family trees and biographical info. It was aimed at the hybridizer of the 50's looking to explore the future trends of development. This is one of my favorite books to just pick up and open at random to see what it is discussing. More often than not you'll see line breeding mentioned, as the merits of a scientific focus were the theme of the day and these authors thought highly of this method of advancement. It was Harry's practice to invite a few members of the BIS to his home in Beaconsfield to hear him read recently completed chapters of his book in progress. The guests were expected to offer criticism of the work, but Harry's formidable reputation tended to inhibit comment. My own attempts to meet his wishes on these occasions earned the gift of a carload of recently dug rhizomes. 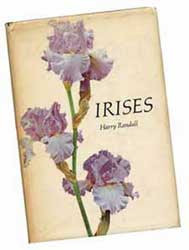 Harry's manuscript was almost complete when he died, and, with final details attended to by Mrs. Randall, George Preston, and other friends, Harry's Irises was published posthumously. There are numerous books about irises produced from this time forward, but I think nothing has yet come out of interest to those into iris history to match the brilliant addition to the canon by Clarence Mahan in his 2007 book Classic Irises and the Men and Women Who Created Them. Here is a book I go back to time and time again. There is always something new in its pages to catch my interest and send me down a new path of discovery. This amazing work greatly expands our knowledge of the people behind the beautiful flowers we now treasure. While these books are now out of print, it is fairly easy to find them offered at Amazon.com, Alibris, Abe's Books or other online book retailers. Sometimes hunting them down is almost as much fun as reading them. I hope you'll explore some of them and help keep the living memory of our favorite flower alive. 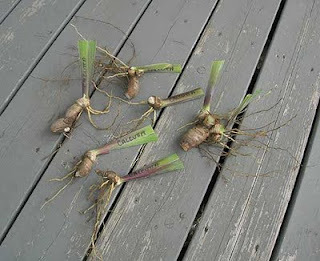 In 1956 the renowned Longfield Iris Farm introduced the latest sensation from the hand of master hybridizer, Paul Cook. 'Melodrama' was a spectacular flower, a bitone with light lavender standards that deepen at the midrib to the same dark lilac tone of the falls. 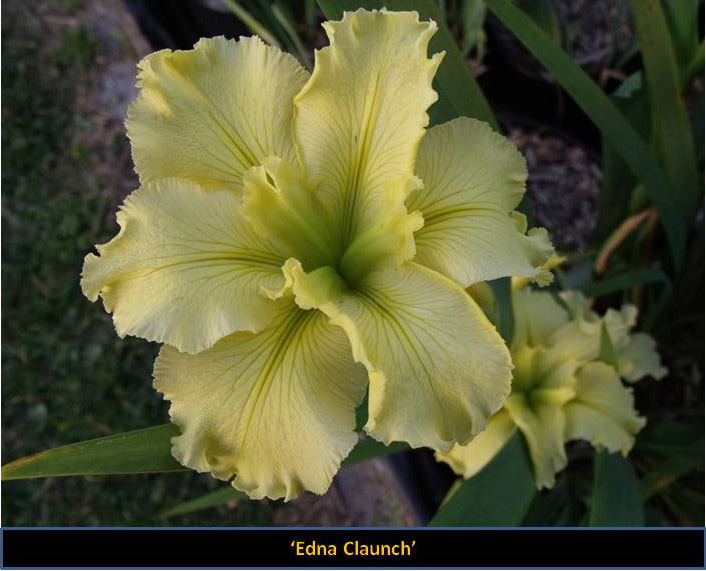 It was an excellent new break in iris breeding and immediately started racking up awards. It was given an Honorable Mention the year it was introduced, won the Award of Merit in 1958, and was a runner up for the Dykes Medal in 1961. Needless to say it was a very well regarded and very popular in its day. Paul Cook had a long and fruitful career with irises and was instrumental in expanding many iris colors and patterns, but is probably best remembered for his work with the amoena pattern, culminating in a Dykes Medal for his masterpiece 'Whole Cloth' - which had been introduced the same year as 'Melodrama'. Thanks to the hard work and dedication (some might say obsession) of Jerry Oswalt you can see the irises of Paul Cook at the Bluffton Memorial Iris Garden in Bluffton, IN. Jerry, along with local volunteers and descendants of the Williamsons and Cooks, has created a space in a local park along the Wabash river where they are collecting all the varieties from this amazing group of local hybridizers. 'Melodrama' is among them. There is also a display at the local historical museum about these iris luminaries. All the wonderful traits that took the iris world by storm in the late 1950's are still there today in this wonderful historic iris. Seek it out and add a little history, and a lot of beauty, to your garden. The summer of 2011 has been a very hard year for drought here in the midwest and the lower middle states. Texas and Oklahoma have set records for highest temps and longest running days over 100 degrees. We have been getting calls almost every day from our customers asking us if they should be watering their irises. Here's my answer to that question and I hope it helps you a little. It is natural for most irises to go dormant in hot, dry weather conditions. We don't water our iris in the fields in any way during the summer months. We went for over 2 weeks here with daytime temps over 100 degrees and the irises are fine. If you were watering some as the drought progressed, it is probably ok to continue right on through the summer. I would have watered sparingly. Too much water in hot temps can and will sometimes rot the rhizomes. If you did not start out in early summer watering, I would not do so, until the temps begins to break. 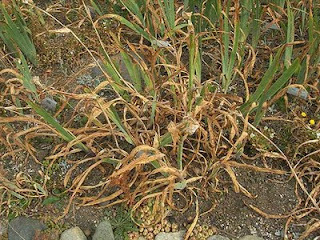 My thought is if you start watering too early in the hot temps, and the plants break dormancy too soon, you may burn the new growth up. 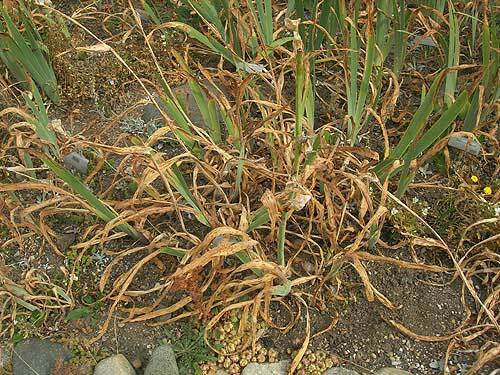 The plants that have not been watered through this period will often look discolored and they will not have full fans. This is normal. The rhizomes have stopped growth and pulled the nurtients back to conserve energy. We also get the question, "Will they die from this drought?" I doubt that there will be many losses, but it is possible that some varieties just won't take the weather and die. I am almost certain, that the losses will be minimal if the water issue is kept in check. The water grown irises are the exception to these ideas. Water irises should not be allowed to dry out in any circumstances in droughts. Hard baked ground is a recipe for losses in these irises. I am guilty of letting them get pretty dry, but I always come through with a good watering before they it hurts them. The photo I have posted is typical tall bearded clump that has been through the drought with no water except one 1/2 inch rain two weeks ago. The next day after the rain, the temps went to 104 degrees. I hope this post makes a few of you sleep a little better helps you if you have not been watering and you need to know when to start again. God Bless you and your gardens. Please remember our troops and our befuddled government. Visitors to my garden are surprised by the irises. The comment I hear most often is "I thought they only came in purple!" followed closely by "they're not supposed to be blooming NOW, are they?" 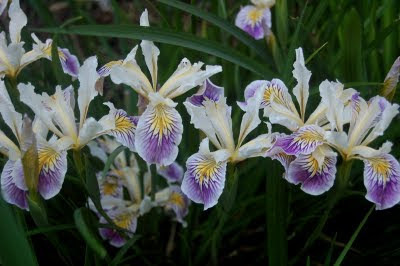 In my Southern California garden, tall bearded irises bloom from March until January, thanks to reblooming varieties. Those of us who live in Mediterranean climates with very late or insignificant frosts can take advantage of the rebloomers to have irises as the main focus of our gardens, since they bloom practically year-round. Reblooming irises are not all created equal. Hybridizers strive to expand the color range and to create more beautiful forms of reblooming irises, but it is a tricky business. Some irises rebloom with great vigor and an abundance of blooms, others are quite stingy and may send up a single flower stalk out of dozens of fans every few years. Some bloom twice on the same plant, and some reproduce so fast that they send out new plants that bloom in the same season. Some have been known to bloom themselves right out of existence! My best performer is, by far, 'Total Recall'. This iris begins blooming at the end of March and blooms right through to July, when it usually takes a little rest for about six to eight weeks, then it starts up again in September and blooms until frost in January. This year we have had an unseasonably cool summer, so it has not taken a break, and is in bloom right now. 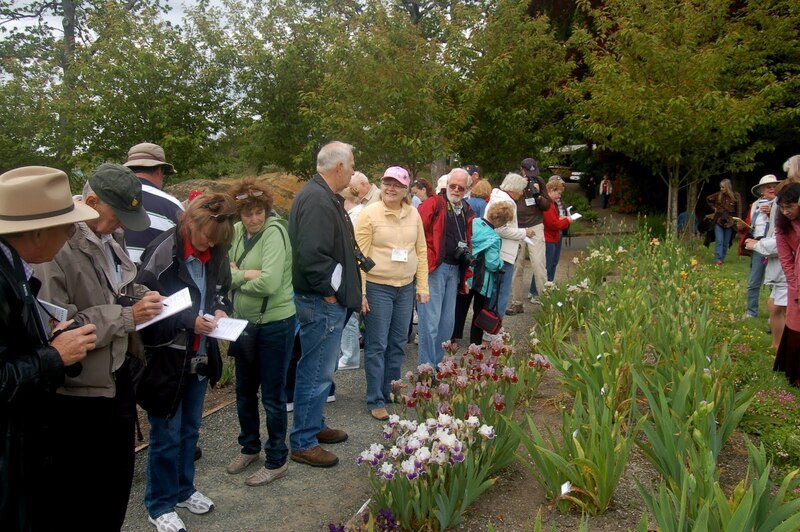 The Reblooming Iris Society, a section of the American Iris Society, has a web page that lists reblooming varieties of irises and the USDA zones in which they have been reported to rebloom. If you would like to introduce rebloomers into your garden, this is the place to start. You may also enjoy the Reblooming Iris Society Facebook Page, where lovers of these plants post information on what is reblooming where, and for how long. I am a newbie to the world of irises, and my experiences are limited to Southern California and to tall bearded irises. Do irises rebloom where you live? What kinds of irises do well there, and which are your favorites? My favorite is usually my newest. 'Rose Teall' (Holk 1995) opened yesterday for the first time, so it's my favorite today. Many iris nurseries specialize in reblooming irises, so check the AIS website or do a Google search for commercial growers in your area. "Are they supposed to be blooming NOW?" Yes! 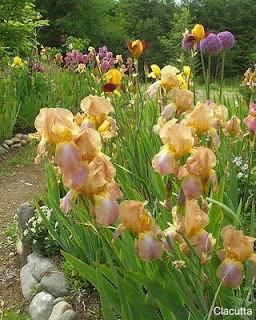 Plant reblooming irises suited to your area and enjoy the beauty and grace of irises, in every color of the rainbow, for weeks on end. Hollywood has based a multitude of movies on the premise of the one-in-a-million long shot paying off and bringing the unknown little guy to the heights of fame and fortune. With 'Snow Flurry' the iris world has its own fairy-tale success story. 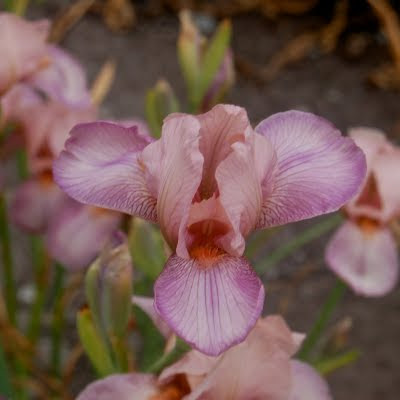 Amongst her early purchases Clara Rees had obtained Thais, a rosy-mauve diploid iris raised by Cayeux in France, with 24 chromosomes, narrow petals and drooping falls. Later on her sister, Ruth Rees, bought three other irises including Purissima, a tall, white tetraploid, for $18; and Clara thought, to quote her own words, that such extravagance proved that Ruth must have taken leave of her senses. However, Clara liked the colour of Thais and in due course she crossed it with the taller Purissima in the hope or getting the rosy-mauve colouring on to a tall stem and larger flower. The aim was an admirable one, but in the ordinary course of events any resultant seedlings would have been sterile triploids with a chromosome count of 36. There was a remote chance, however -- probably one in several thousand -- (a) that one of the pollen grains of Thais might have more than its usual quota of chromosomes, (b) that this grain might fertilize Purissima, and (c) that any seedlings might therefore be fertile tetraploids with 48 chromosomes. Without knowing all this at the time, and with a boldness of which Sir Michael Foster would surely have approved, Clara Rees made her famous cross and succeeded in producing one solitary seed-pod. This pod, instead of containing, as expected, from 20 to 40 seeds, yielded only two, and one of these was so shriveled that it was promptly thrown away. The remaining seed was almost discarded because Clara Rees thought that there was no use bothering with a single one; but a spark of hope kindled the fire of compassion in the Rees household, the seed was saved and sown, and it ultimately proved of greater value than the Scriptural pearl of great price. If I were a parson I could preach a tremendous sermon on this historic incident! 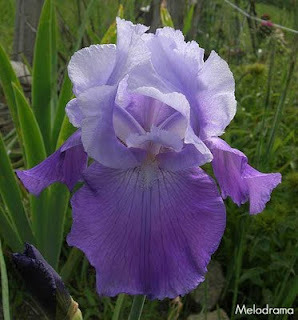 In 1938, three years after pollination, the seedling gave its first flower -- not the rosy-mauve that had been hoped for, but a white slightly tinged with blue. One can imagine the delight and excitement of those who first saw the plant, winch had qualities not previously seen In a white iris -- broad, ruffled petals, clear hafts, several buds in each spathe, good branching and and excellent blue-green foliage. Nothing was done with the seedling in the first year of blooming except that it was dug up, split up, and the half-dozen resultant rhizomes replanted. Next year they all flowered and caused even more excitement. The two sisters decided that something ought to be done to enable other people to see the new arrival, and Clara afterwards wrote: 'Ruth felt that the bloom deserved the scrutiny of an experienced iris breeder, so she cut two of the individual blooms and traveled to Berkeley by street-car, train, ferry and taxi and showed them to Carl Salbach who at once asked, "Young lady, where did you get these?" Ruth told him that they had come from a seedling raised in the back yard of our home in San Jose.' Salbach quickly visited that back yard and bought the entire stock of Snow Flurry, which had then increased to 17 rhizomes, but he allowed the raiser to keep one rhizome. The next chapter of the 'Snow Flurry' story belongs to Orville Fay who, when he read the description in Salbach's catalogue, realized that if the parentage, Purissima X Thais, was true it would be a great breeder. He therefore asked his friend, Junius Fishburne of Virginia. who was attending an Iris Convention in California, to look at the plant and answer certain questions -- Were the spathes papery? Were there many buds in each socket? Was the foliage vigorous and blue-green? and so on. As the answers were all satisfactory Orville bought it, and we all know what he has done with it. 'Snow Flurry' went on to become perhaps the most celebrated parent in iris history. Thousands of iris varieties have these particular genes somewhere in their ancestry. It changed the course of iris breeding for generations and has left a legacy that others can only aspire to. And today, 'Snow Flurry' is still a fantastic garden iris and a fitting legacy to the ladies who recognized its potential. I find that people who go to national conventions attend for different reasons. Some go to enjoy an outing to a favorite destination. Others, to see iris types they don’t normally grow, while others to see the same iris they grow at home and to find ways to grow them better. Whatever the reason, I’m always amazed at the variety of people that comprises AIS, and their passion for irises. If you’ve been to a garden trek at your local club, you probably have observed all the friendly discussions that have turned up around our favorite plants. Well, I think those friendly discussions intensify at national conventions. Many of us become iris fanatics, and we could spend a serious amount of time observing a certain bloom, certain foliage, and discussing their many attributes, or perhaps find many faults. I think discussions, or call them arguments, are all good for our gardening society, as they are part of our educational process for better understanding iris growth habits, soil conditions needed for successful bloom, and for realizing better development of plants. (Above: Unknow Pacific Coast Native Iris at Spiers Garden, Salt Spring Island, BC. You will probably not see these PCNIs at many conventions). But for me, one great reason to attend national conventions is as follows. I love being around our older -- excuse me, more mature -- members. Many have grown irises for years and know exactly how to nurture each variety for thriving results. I love listening to their stories of past conventions, and their own conversations with hybridizers and growers. Just recently, one of them told me why she so endeared a certain garden visit she paid to Monty Byers, and how he was so special in her heart. It brought so much more meaning to my experience of observing Monty’s creations. Be it not for their shyness, we could find that these experienced members have a wealth of knowledge. So, next time you attend a convention, perhaps CALIZONA GOLD 2012, establish a friendly conversation with AIS members, but specifically with "mature" members and you may just find something new about irises that you never new before. Now, please tell me your reasons for attending an AIS national convention.